Scientists from the University of Copenhagen and the Paul Scherrer Institute in Switzerland have, for the first time, created a 3D image of food on the nanometer scale. The method the scientists used is called ptychographic X-ray computed tomography. It has promising prospects as a more detailed knowledge of the structure of complex food systems could potentially save the food industry large sums of money and reduce food waste that occurs because of faulty production. The researchers found that 98% of the fat globules in the cream cheese-like food system are cemented together in a continuous 3D network. They have visualized the network using the same techniques that are used in computer animation. 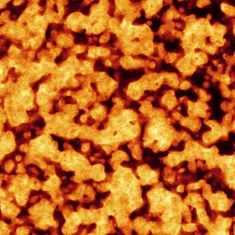 The coherent network of fat globules (approximately 25% of the volume) is seen in the video as the cohesive yellow structure, while the coherent structure of water fills out the area between the fat and is not highlighted by any color for clarity. The small areas of fat or water, which are not connected to the remaining fat or water structures, are red and blue respectively. The grey areas are the food ingredient microcrystalline cellulose. The network shown in the video is about 20 microns in diameter and made of fat globules of about 1 micron in size. "There is still a lot we don’t know about the structure of food, but this is a good step on the way to understanding and finding solutions to a number of problems dealing with food consistency, and which cost the food industry a lot of money," says Associate Professor Jens Risbo from the Department of Food Science at the University of Copenhagen. He is one of the authors of a recently-published scientific paper in Food Structure, which deals with the new groundbreaking insight into the 3D structure of food. The researchers used a cream based on vegetable fat for the research. The cream system is a good test material, since it can represent the structures of a large group of food systems, for example cheese, yogurt, ice cream, spreads, but also the more solid chocolate. All the aforementioned products contain liquid water or fat as well as small particles of solid materials, which stick together and form three-dimensional structures – i.e. a network that provides the consistency that we like about cheese, yogurt or chocolate. In cheese and yoghurt the casein particles form the network. In chocolate it is the fat crystals and in ice cream and whipped cream it is the fat globules. "It's about understanding the food structure and texture. If you understand the structure, you can change it and obtain exactly the texture you want," says Jens Risbo. To create a three-dimensional model of the food and convert it into images and video, the scientists have been in Switzerland, where they have used the Swiss Light Source (SLS) synchrotron at the Paul Scherrer Institute. In the synchrotron electrons are accelerated to near speed of light. The synchrotron is used for research in materials science in areas such as biology and chemistry. The method the researchers used is called "ptychographic X-ray computed tomography." This is a groundbreaking new method for creating images on the nanometer scale, which also provides a high contrast in biological systems. The synchrotron in Switzerland is one of the leading places in the world in this area, and it was the first time ever that it was used within food science. "We have been using the tomography principle, also known from an X-ray CT (computed tomography) scanner. The sample of the food system is rotated and moved sideways back and forth with nanometer precision, while we send a very strong and focused X-ray beam through it. The X-rays are deflected by interacting with electrons in the food, and we shoot a lot of pictures of the patterns that the defleted X-rays form. The patterns are combined in a powerful computer, which reconstructs a 3D image of the sample. The Swiss scientists of the team have created a device that can move and rotate the sample with ultra-high precision, allowing us to see the small details," says Research Assistant Mikkel Schou Nielsen, who has recently completed his Ph.D. in tomographic methods applied to food at the Niels Bohr Institute in Copenhagen. The reconstructed 3D image can be described as a three-dimensional table of numbers describing the electron density (the number of electrons per volume) through the entire sample. The various food components, such as water and fat, have different densities and hence different electron density. 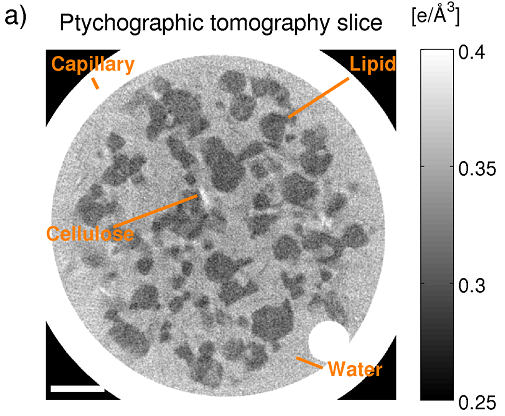 Water is heavier than fat, which is known from oil that settles on top of water when you try to mix them, and it is this contrast in electron density which causes X-rays to deflect to different degrees and eventually to form 3D-images of the sample. Figure 1 shows a 2D slice of the three dimensional structure. Areas with higher electron density appear lighter on the figure. Water thus appears light grey, while fat appears dark grey, and the glass around the sample with a high density is seen as a white ring. One may now use the electron density (greyscale) to identify the various food components and study their location and structure. Figure 1. Greyscale, showing the electron density in the various food components, which also discloses their location and structure. Illustration from M.S. Nielsen et al. Food Structure 7 (2016) 21–28. The vegetable-based cream which the method is used on consists of several ingredients. In addition to water and vegetable fat, it contains milk protein, stabilizers and emulsifiers. 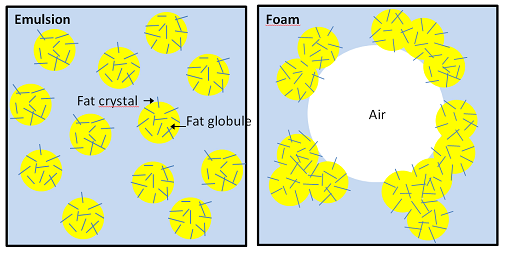 By adjusting the addition of emulsifiers, it is possible to achieve a state in which the cream continues to be fluid until you whip it to foam, whereby all the fat globules are reorganized and sticking together on the outside of the air bubbles in a three-dimensional system (see Figure 2). "It is a difficult balance, because you only want the fat globules to stick together when the cream is whipped - not if it is simply being exposed to vibration or high temperatures. When the fat globules nevertheless begin to stick together prematurely - for example due to too many shocks during transport - the cream will get a consistency reminiscent of cream cheese. It becomes a relatively hard lump that can be cut," says Postdoctoral Researcher Merete Bøgelund Munk, Department of Food Science, University of Copenhagen. Merete Bøgelund Munk's Ph.D. project, “The physical stability of whippable oil-in-water emulsions. Effects of monoglyceride-based emulsifiers and other ingredients”, was fundamental for the research. The Ph.D. project is made as a collaboration between the Department of Food Science at the University of Copenhagen and the food ingredient company Palsgaard A / S.
This undesirable cream cheese-like state of the vegetable cream system is nevertheless extremely interesting for researchers. "The organization of the fat globules and the network structure after the cream has been converted into a ‘cream cheese-like’ product is exciting because the mass is now sliceable, even though the system consists of 65% water and only 25% fat and some other ingredients and sugars. That means we have a network structure that captures a lot of water. There are many foods with similar network systems of something solid in something liquid, where the liquid is typically, but not always, water. This applies to all semi-solid and solid products such as chocolate, butter, cheese and spreads. The network of the cream cheese-like system is thus a model for something general in our food," says Associate Professor Jens Risbo. It is the structure of the networks which forms a texture that makes you want to bite into a piece of chocolate and cut yourself a piece of cheese. But the structure and the networks are something of a mystery, because until now you could only see the surface or only slightly underneath the surface of the food material on the microns scale and the images you could see have only been two-dimensional. "If we eventually come to understand the structure of chocolate, we can change it and obtain exactly the consistency that we want. A lot of money is wasted because the consistency of chocolate is really hard to control, so the end product is not good enough and must be discarded. A possible future understanding of the crystal network in chocolate might mean that we will be able to develop components that prevent the chocolate from becoming grey and crumbly, and thus unsaleable. It is certainly a possibility that tomographic methods could be developed so we would be able to understand the mysteries of chocolate," says Associate Professor, Jens Risbo, Department of Food Science, University of Copenhagen. "Ptychographic X-ray computed tomography can be compared with a CT scanner in a hospital. Instead of getting an image of a patient's organs, we are looking into food. But, unlike a CT scanner, we can go down to the nanometer scale," says Jens Risbo. The sample with the cream cheese-like system that the scientists X-rayed was about 20 microns thick. "It would take too much time and too many calculations to develop a nanometer resolution of the cream system for a whole package of cream cheese from the fridge. The amount of information and calculations would simply be too great. Although X-rays can almost go through everything, you lose the intensity of the beams, the more they have to shoot through," says Jens Risbo. Basically, you can make X-rays in two different ways. If you go to the dentist and have an X-ray done, this is done using an X-ray tube, which can be compared with a cathode ray tube showing the pictures in an old type of television, where electrons are not accelerated to very high speeds. In the X-ray tube the electrons collide with a metal, such as copper, which now emits X-rays. The X-ray tube is not so powerful, but you can make medical photos and also do some research work with this type of X-rays. 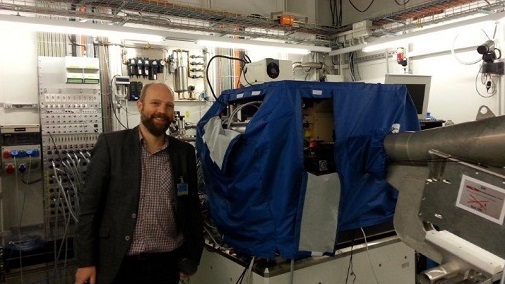 But if you want to examine very small samples, things that are changing rapidly, or make tomography at the nanometer scale, you will use facilities like Swiss Light Source or the Swedish synchrotron MAX IV which opens in Lund, Sweden, this year. "Technically, it is electrons that are accelerated up to nearly the speed of light and circulates in a ring controlled by electromagnets. The electron beams are then deflected and will then emit intense and energetic X-rays," says Associate Professor Jens Risbo, Department of Food Science, University of Copenhagen. The Swiss Light Source, SLS, is funded by the Swiss government and scientists from around the world can apply to use syncroton X-rays and related scientific equipment under the guidance of local scientists. The article "Ptychographic X-ray computed tomography of extended colloidal networks in food emulsion" originates from the Nexim project led by the Niels Bohr Institute at the University of Copenhagen and Postdoctoral at Department of Food Science, University of Copenhagen, Merete Bøgelund Munk's Ph.D. project, “The physical stability of whippable oil-in-water emulsions. Effects of monoglyceride-based emulsifiers and other ingredients”. The authors are from the Department of Food Science, the Niels Bohr Institute, Department of Food Chemistry, all at the University of Copenhagen, DTU Energy and the Paul Scherrer Institute in Switzerland.